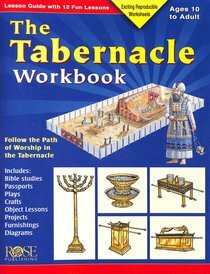 This 40-page workbook is packed with reproducible activity and information sheets on the Tabernacle, the sacrifices, the furnishings (including the Ark of the Covenant), the priests' garments, and the symbolism that points to Jesus. Includes diagrams of the Tabernacle, drawings of all of the furnishings, and pictures of the High Priestly garments. Includes worksheets, codes and clues, puzzles, and activities. Perfect for youth or adults. Fisher is an award winning creator, director and producer of home and corporate videos as well as two national cable television series.